Thank you, Steve, for that kind introduction, and for inviting me to speak here this morning. And thanks to all of you for your important work leading the United States into a clean energy future. This is a terrific gathering on an important topic. Yesterday you began by hearing from Secretaries Ken Salazar, Steven Chu, and Tom Vilsack; this morning you start with me. Going from “True Grit” to “Spider Man, the Musical.” Apologizes for the conference organizers. I hope I have something interesting to say. It’s impressive to see so many people here discussing strategies for actually deploying renewable energy, and for doing so in an environmentally and culturally sensitive way. The work you’re doing on the ground today is more important than ever before. As a country, we are facing an energy challenge unprecedented in its urgency, its stakes, its scope, and its opportunity. For 200 years, we have relied almost exclusively on high-carbon fossil fuels like coal and oil to power economic growth, raise living standards, and increase mobility. Now, maintaining the status quo is no longer a possibility—and how we choose to produce and consume energy today will change our country for either good or ill for many generations to come. At the Center for American Progress, we’ve long advocated for building a new economy based on clean energy, innovation, and diversification. We believe that this transformation presents us with profound opportunities for economic growth and environmental protection: With clean energy, we not only have an opportunity to avoid a worst-case climate scenario; we have an opportunity to create millions of new jobs, deploy new sources of energy that are clean and domestically produced, and free ourselves from our dangerous dependence on foreign oil. However, the way we build our clean energy future also matters. We’re looking to clean energy today because we recognize that high-carbon fossil fuels threaten our economy, our security, our health, and our cultural and environmental heritage. This means that going forward, we must be careful to develop clean energy in a way that infers all the protections that fossil fuels do not. This is especially true when it comes to our public lands and waters—which will be as central to our clean energy future as they were to our fossil fuel past. The Department of Interior manages tens of millions of acres that have significant solar, wind, or geothermal potential. As I know you heard yesterday, our offshore exclusive economic zone, extending 200 miles out from our shores, has wind resources capable of producing more than four times our nation’s current electricity generation capacity, according to data compiled by the National Renewable Energy Laboratory in 2010. As we begin to look to large-scale renewable generation, it is nearly impossible to imagine our clean energy future without tapping into the enormous clean energy potential of our public lands and public waters. But I also think it’s important to remember that done right, clean energy development is central to protecting the lands themselves. Climate change poses an enormous threat to our public lands and resources. It threatens to upset our prairies, our deserts, our coasts, and our waters in ways that are hard to even imagine—and is already causing irreversible damage to some of these fragile ecosystems. Transitioning from carbon-intensive fuels to clean, pollution-free energy offers a way to soften the impact of climate change, and in so doing, presents a new stewardship strategy for protecting our lands and waters in the future. So even as we look to expand clean energy production on public lands and in public waters, we must keep the day-to-day work of environmental protection in mind. Renewable energy projects can still disrupt the natural environment if put in the wrong places and if proper precautions are not taken—an outcome fundamentally at odds with the reasons we’re developing clean energy in the first place. And because we’ve never built wind and solar projects of this size and scope before, we have to take special precautions to protect the lands on which they are built. With such large-scale developments, there’s the potential for huge payoff if everything goes right—and the potential for big problems if things goes wrong. It’s also important to recognize that some areas are just not appropriate for utility-scale renewable energy projects at all. Every president since Teddy Roosevelt has known that there are great places in America that are worth preserving for future generations. Certainly, the president I worked for, Bill Clinton, understood that. He protected more land than any president since Teddy Roosevelt. That’s why the administration and this department must take a strategic, coordinated, and balanced approach to clean energy development from the very start. These projects are new; and investors, conservationists, and community members all have important opinions on how they should be built. To get buy-in, to create greater certainty for stakeholders, and to start building these projects in earnest, we need to put in the work now to create a good development process that we can follow going forward. The administration’s experiences with renewable siting so far have demonstrated why this is the case. For instance, this department took a first stab at moving clean energy forward through a “fast-track” permit approval system last year. To jumpstart renewable energy development on public lands, and to help projects qualify for Recovery Act funds before the program expired, Interior put 34 relatively “shovel ready” renewable energy projects on the fast-track for approval last year. Of these, nine solar and two wind projects were approved. The fast-track process was perhaps driven by necessity; it was certainly a learning experience for everyone, and not necessarily a good experience for some. Several areas selected for development were very significant to the local communities, and to conservationists who were concerned about the projects’ impact on wildlife and water resources. Because groups like Defenders of Wildlife, National Resources Defense Council, the Sierra Club, and The Wilderness Society engaged the Bureau of Land Management to reshape and revise the projects, acceptable outcomes were reached in just about all of these cases. But certain stakeholders still felt shorted by the fast-track process. And while permits were issued for nine projects, when and whether several get built is yet to be determined. In the end, it’s steel in the ground, not permits, that matter. To its credit, this department took the criticisms of the fast-track process to heart and is updating and improving the permitting process substantially. They still have, in my view, some work to do. The new solar energy plan Secretaries Salazar and Chu announced in December encourages projects to be built where they make the most sense—where environmental conflicts are few, access to transmission is best, and supporting infrastructure exists or can be created at lower costs. Yet the preferred alternative in this plan would permit development on 22 million acres despite the fact that many of these acres support critical and fragile habitats and should not be developed. A better alternative would be to direct utility-scale renewable development to solar zones in the six Western states. Such solar zones, where environmental analysis is done in advance and access to transmission exists or is planned, offer the highest renewable energy potential at the lowest risk. Focusing solar development within these zones could speed up the approval process by directing limited agency resources to places where projects could be built more quickly and improve coordination and collaboration amongst stakeholders. This approach would also sidestep the conflicts and delays that bogged down the last set of BLM-approved solar projects—making the zone system the most efficient and effective way to operate. And the 600,000 acres included in the zones give BLM more than enough room to meet their renewable energy production goals over the next several years. This department is also fleshing out these smart development plans to give developers and government managers additional strategies for building clean energy responsibly. The guidelines the Fish and Wildlife Service and the Bureau of Land Management issued on Tuesday demonstrate that this department has reached out to stakeholders and is trying to put the lessons learned to good use. Of course, today’s workshop is further evidence of the department’s interest in reaching out to stakeholders to learn from the past and improve the process going forward. These cooperative meetings are a good business practice, and I commend Secretary Salazar for continuing to take input and working with the stakeholders here today to get the process right. The practical benefits of continuing to learn and work together to build a better strategy are tremendous. Selecting green light development areas will be a huge boon to developers and investors, who are looking for greater market certainty and a more straightforward regulatory process. Building a better permitting process will also provide much greater certainty to conservationists and community members who are rightly concerned about fragile ecosystems and water resources. And engaging all partners at the beginning can help make sure that utility-scale projects encounter far fewer challenges and obstacles throughout the permitting process. I’ve talked some about what this department can do better, so I want to take a moment to applaud the Departments of Interior and Energy for something they’re doing right, right now. After years of especially onerous delays, the departments are finally pushing forward on offshore wind energy. Last spring, Secretary Salazar gave the green light to what will become our nation’s first offshore wind energy facility: the Cape Wind project off the coast of Massachusetts. Cape Wind’s permitting process stretched out for more than a decade, making the project a poster child for our nation’s inability to capitalize on the wealth of clean, renewable energy lying just off our shores. Now, the Departments of Interior and Energy are moving to make sure that the Cape Wind permitting quagmire never happens again. On Monday, Secretaries Salazar and Chu came together again to issue a National Offshore Wind Strategy to accelerate wind development in four strategic zones off the mid-Atlantic coast. These zones had previously been considered for oil and gas development—so looking to wind development in these waters is a clear step in the right direction. But if Cape Wind taught us anything, it’s that a wide variety of stakeholders also need to be involved in the offshore planning process. The Cape Wind developers certainly failed to look for input from the community and from conservationists at the beginning, and suffered extraordinary delays as a result. I know that as the secretaries begin to update and streamline the offshore permitting process, they are applying the lessons and methodologies of the work they’re doing on land to be sure that when it comes to our oceans only the right projects are built in the right places as well. Of course, for offshore wind or for desert solar, having a good permitting and development process in place is crucially important, but only a piece of what it will take to build a clean energy future. As investors, community members, government managers, and environmental groups work together to build clean energy projects from the ground up, government needs to step in from the other side to give needed support to innovation and deployment through a variety of policy measures. Even without comprehensive climate and energy legislation, there is still an enormous amount Congress and the administration can do to support your efforts. They can provide low-cost financing to get your projects up and moving, and to push down the cost of large-scale developments. They can make sure the tax code favors clean renewable energy rather than energy from polluting resources that threaten our public health. They can meet the president’s challenge in the State of the Union of producing 80 percent of our electricity by 2035 from clean resources, and do it the right way by following the lead of states and emphasizing renewable energy in that mix. They can right size regulation, keeping important environmental protections in place while streamlining the regulatory process for projects located in the right areas. They can invest in infrastructure—most importantly, the transmission infrastructure that will link renewable projects to the grid to provide clean, renewable power to homes and businesses across the country. That will take commitment across the government and across the country. Despite the highly partisan environment in Congress, I believe that the president will make it a priority to move forward with these initiatives over the next two years. But as we look for support to come from the top, we have to continue to work together to put the right processes in place from below. Then, as we take up the 21st century energy transformation in earnest, we will be sure do so in a way that protects our 20th century achievements. That’s why I’m so glad to be here with you at this workshop today. Again, Interior brought us together to sit at one table and discuss our regulatory, siting, and conservation concerns. This collaborative, cooperative approach is the best way to develop an effective renewable energy strategy going forward, and I look forward to seeing the outcome from these conversations. Together, I am confident that we can make substantial progress in the right direction. 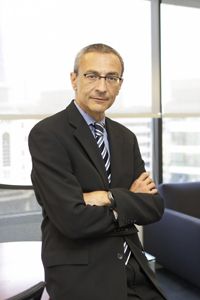 John Podesta is President and CEO of American Progress.